We’d love your help. 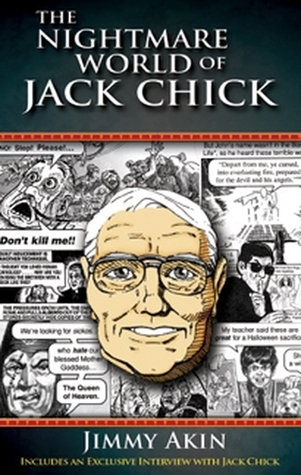 Let us know what’s wrong with this preview of The Nightmare World of Jack Chick by Jimmy Akin. You've probably seen one or more of Jack T. Chick's comic book-like tracts. They have titles such as Are Roman Catholics Christian?, The Death Cookie, and Why is Mary Crying? And they're full of wild, false, and downright malicious charges against the Roman Catholic Church and its teachings. Read them, and you step into a nightmarish world of shadow and intrigue, a world of You've probably seen one or more of Jack T. Chick's comic book-like tracts. They have titles such as Are Roman Catholics Christian?, The Death Cookie, and Why is Mary Crying? And they're full of wild, false, and downright malicious charges against the Roman Catholic Church and its teachings. Read them, and you step into a nightmarish world of shadow and intrigue, a world of paranoia and conspiracy theories, a world where the Catholic faith is the devil's greatest plot against mankind. Chick has sold more than 700 million of these tracts, and has turned millions of Catholics and Protestants against the Church and its teachings in the process. To ask other readers questions about The Nightmare World of Jack Chick, please sign up. Jack Chick is nuts. Is he still alive? Great book. As always with Jimmy Akin, it's thoroughly researched, and calmly and charitably expressed. In addition, the book is a fun topic, not technical and it's a quick read. Great choice for teens just getting going with apologetics. My son loved it!